Taylor Wimpey has announced that it is putting aside £130 million to resolve the doubling ground rent scandal. The announcement was made this morning on the eve of Taylor Wimpey’s annual general meeting in London today. Sir Peter Bottomley and Jim Fitzpatrick MPs were contacted by Taylor Wimpey CEO last night. They have been invited to discuss the issue with Mr Redfern at 10am. Sebastian O’Kelly, of the Leasehold Knowledge Partnership, said: “This scandal came to light owing to the efforts of LKP, a minnow organisation that is a registered charity. “We were aware that doubling ground rents would blight these properties and make them unsellable. “It is very likely that that generation of Taylor Wimpey management also knew that these lease terms would come back to haunt the company. Presumably after they had picked up undeserved bonuses and left. “Homebuyers have been systematically cheated by Taylor Wimpey – and developers who imitate it with these onerous lease terms. “Homebuyers wanted homes and trusted a plc housebuilder. Taylor Wimpey created an investment asset class – the freehold – which it then traded to anonymous and murky investors, who hide their beneficial ownership behind nominee directors. “This ground rent racket is wealth erosion on a massive scale, which has fallen mainly on young first time buyers and their families. “It has revealed the rotten core of leasehold as a form of property tenure. Sir Peter Bottomley said: ““Taylor Wimpey has recognised that leaseholders have been disadvantaged by at least £130 million. Sir Peter referenced the report of the All Party Parliamentary Group on leasehold reform published today. Government and Parliament can act and have to act to reform leasehold. Developers have to rectify the impact of their past behaviour on innocent leaseholders. Owners of the freeholds of residential leaseholders have to end exploitation. Unfair leasehold terms should be declared void. Residential flat and house leaseholders deserve fair treatment. Sebastian O’Kelly 07808 328 230. If in such a short space of time Taylor Wimpey has been forced to set aside 130m pounds in order to try and resolve such a small part of the leasehold selling scandal (and remember they are only talking about leaseholds with doubling ground rent clauses not those on RPI and they are excluding Taylor Wimpey homes that have been re- sold) just how large will the real costs of making true restitution to the victims that purchased Taylor Wimpey homes in good faith? And it’s not just Taylor Wimpey alone! What will the total bill be when Persimmon, Barrett, Bellway, Linden et all are added in?. Taylow wimpey have still refused to include resales in thier review , they have admitted these houses are unsaleable with these doubling clauses and are infact blighted but what are the thousands of us that bought T W resales to do ? According to my calculations presented in comments on this website some time ago, £130million should be ample for EVERY occupier of a TW leasehold house to buy their freehold at the original TW price. The compensation would make up the difference to the present freeholders price. But it needs sorting now and TW need to put pressure on these freeholders to sell. That would result in relieving the leaseholders worries and put TW in a stronger position over the other Developers who gave yet to take any action. True Mr E. I was just a bit carried away!! In my defence I did state that £130 million was just the start and that resales etc must be included in the package. Anyway HOORAH for ” Not a bad step to n the process” ! HOORAH for “Not a bad step in the process” ! Petty cash if this quietens down the press and allows them to continue developing leasehold flats (instead of commonhold) for long-term profit. They are a business at the end of the day. Flat Leaseholders have to campaign for ‘Commonhold’. They must follow the excellent example set by the NLC and set up a facebook campaign. If they choose not to then they must except the status quo. They must realise that they have to fight for change. NO excuses. 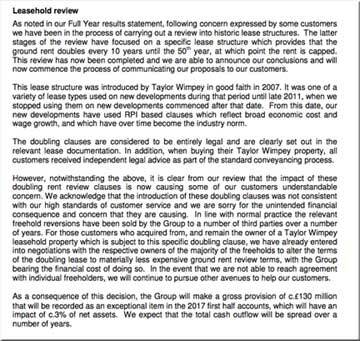 TW LEASEHOLD REVIEW states that they are only looking at compensation for doubling ground rents between 2007 to 2011. Apparently TW stopped unfair leases from 2011. Not entirely true. As LKP will know, TW partners with the Mayor of London and Housing Associations on regeneration schemes and are using the German word Uberhaus to market 3 bedroom properties where yes you guessed it the lease has 10 year doubling ground rents. Haus sounds and translates to house in english but technically TW are correct. The first review is in just 8 years and Help to Buy is available on this Greenwich development. Does anyone else know about these developments ? As always with anything leasehold, freeholders can find a myriad of ways to extract money from their tenants. £130m is a small sum out of the vast profits £744m last year that TW has made from leasehold tenants. Help to Buy is swelling their coffers and they expect to get some plaudits for being the first to throw the dog a bone. The Mayor of London wants spare Transport For London land to be used to build affordable flats. He wants to do this in part to help with London’s housing crisis. Michael- Surely that can’t be right because it is just one more abuse where the leaseholder pays. .It is an outrage if the Mayor of London is raising cash through leasehold.Is there no end to the creativity used to legally rob lessees. Joe, the answer to your question is NO! Flat Leaseholders have to wake up- be proactive and take on the Freeholders and their spivvy managing agents. They cannot expect others to fight their battle. Cest la vie! Take the fight to these Rachmanist wannabes. Kim you missed my point that London regeneration sites including TW still have house and haus leaseholds not just flat leaseholds. LKP has numerous stories where flat lessees are spending vast amounts of their own money in the courts and tribunals and these cases are constantly in the media. Facebook is great but there are other publicity outlets. It is unhelpful to say flat tenants expect others to fight their battle because whether you use facebook or contact journalists,MPs,LKP or go on TV does not matter, it is all publicity. LKP campaigns for all leasehold abuses- lease extension valuations, managing agents overcharging, doubling ground rents, retirement home exit fees etc. not just Egregious house leaseholds. Ending leasehold robbery is what should unite everyone. Joe it was not my intention to be ‘unhelpful’However my comment was directed toward the leaseholders who moan about the service charge but won’t back a fellow leaseholders that wants to end the status quo. If flat leaseholders band together and ‘Out’ their managing agents it can only be helpful. The truth is that some don’t want to rock the boat as they think it will affect saleability. I agree that ending leasehold is our united goal and we must all play our part.